Coupon codes is the general management tool for discount and promotion coupons that can be attached to Nosto triggered emails and pop-ups. A key part of a promotion is the offer meaning the coupon code. Nosto doesn’t create the coupons for you. Codes are created on your cart solution and then uploaded / imported to Nosto through the web admin panel as advised in this manual. Nosto supports two different types of coupons: Multi-use coupon which is the same coupon for all visitors, making it a great option for short campaigns and when a coupon is given to all customers. Multi-use coupons are not managed under coupon management as the code is the same to all. Personalized coupons allow handing out unique and personalized coupons from a pool set up separately, making it better and more personal for campaigns triggered by a specific activity. This article covers how to add and manage personalized coupon pools using the coupon management tool. Whichever coupon type you decide to use, we suggest to test codes in your cart solution before uploading these to Nosto to ensure codes actually work before uploading them to Nosto! Before getting started, create a coupon pool in your e-commerce solution. Nosto supports numbers 0-9, letters a-z, A-Z and characters (-+_!@?). Maximum length for the coupon is 32 characters. The coupon menu displays a list of active and unused coupon pools and also a real-time status of coupons in the pool. In the example below, one demo pool is actively used while the one on top is paused and two others have been created but coupons have not been uploaded. Create coupon pool starts the process. First step requires to name a coupon pool descriptively. Expires on is a value that Nosto uses for disabling a feature using the pool and notification emails when coupons have expired and are about to expire. Coupons themselves don’f feature any meta-data about the expiry date so in case coupons are due to a set date in your e-commerce solution, align the expiry value accordingly and click save to proceed to the next step. Pop-up features are relying on coupon pools meaning that if a coupon pool is depleted or expired, it will automatically disable a pop-up campaign using the pool. A coupon can also be attached to triggered emails, but with emails only the segment of the email where a discount is offered and communicated is removed when a coupon pool expires or runs out of codes. In the coupon upload you can upload a .csv file including the coupons. Coupons need to be in separate cells one per line when uploading a .csv. Alternatively you may use the text area and paste codes similarly one per line as seen in the example below. Do not use commas or semicolons to separate vouchers as every character counts. Coupons are also validated, meaning that if two of the same code are detected an upload will return an error. Also spaces will return an error as seen in the bottom example. After uploading coupons successfully a pool details are displayed. “Given” displays how many coupons have been used (sent). Status-switch disables or enables the coupon pool. Note that deleting a pool is not allowed in case one or more of email or pop-up campaigns are using a coupon pool actively, meaning you need to remove or disable coupons from the campaign first. Also an expiry date needs to be in the future in order to remove a coupon pool. 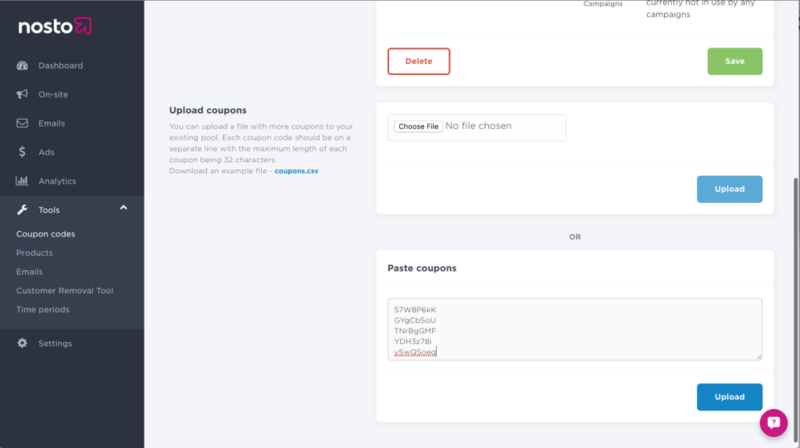 Attaching coupons is introduced in detail in email features and discount pop-up feature, but in brief, after coupon pool has been created it is attached to selected campaign(s) under respective campaign settings. When coupons are about to run out or the expiry date gets closer, the account owner will receive email notifications. Adding a new pool requires simply repeating steps “upload coupons” and setting the selected campaign(s) to use the new pool under each campaign. Every Email or pop-up campaign can have a dedicated coupon pool or alternatively all campaigns can use the same coupon pool.